A special thanks to those people and firms listed below that helped make the auction such a success at ABI’s 23rd Annual Southwest Bankruptcy Conference, held Sept. 10-12 at the Four Seasons Las Vegas in Las Vegas, Nevada. 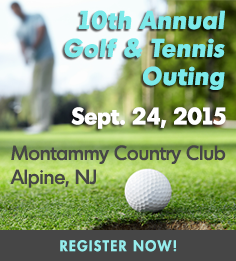 Sept. 24—10th Annual Golf & Tennis Outing: Jointly hosted by ABI, the New York Institute of Credit and the Northeast Chapter of the International Factoring Association, this event at the Montammy Country Club in Alpine, N.J., will include a shotgun golf tournament and a tennis tournament, followed by cocktails, dinner and awards. Register here. Oct. 20—Western Region Dinner: The ABI Western Region Endowment Fund Committee presents a night of fine wine and delicious food at Upstairs2 in Los Angeles. The event is now sold out! Thank you to our sponsors Deloitte CRG, Donlin, Recano & Co., Inc., DSI, Pachulski, Stang, Ziehl & Jones, Robins Kaplan LLP, Rust Omni, Sierra Constellation Partners, and Smiley Wang-Ekvall. 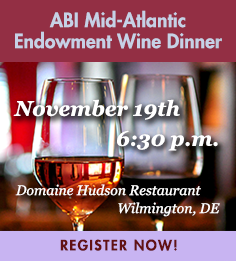 Nov. 19—Mid-Atlantic Wine Dinner: Join the ABI Mid-Atlantic Region Endowment Fund Committee for a multi-course wine-pairing dinner featuring the wines of Le Cadeau Vineyard in Oregon. The event will be held at Domaine Hudson in Wilmington. Thank you to our sponsors Gavin/Solmonese, Polsinelli and Proctor Heyman Enerio LLP. If you are interested in sponsoring, please contact Sharisa Sloan at ssloan@abiworld.org or 703-739-0800. Register here. Dec. 3–5—Winter Leadership Conference: Give and Get Noticed! ABI members who pledge or contribute at or above the Sustaining Member level ($2,000 and up) will be recognized at the luncheon on Friday, as well as during the Casino Night event that evening. Casino Night will benefit the ABI Endowment Fund. Register here. to the Endowment Fund, you may benefit by making your contribution to Combined Federal Campaign #11391. Your funds will be used to support research and education on insolvency. Please consider contributing during the current campaign season (Sept. 1-Dec. 15). Contact ABI Chief Financial Officer Kathy Sheehan at (703) 739-0800 or ksheehan@abi.org for more information. Michelle M. Harner, who last year was the Reporter to the ABI Commission to Study the Reform of Chapter 11 and whose work was recognized at this year’s Annual Spring Meeting with the Annual Service Award, is this fall’s Robert M. Zinman Resident Scholar. A Professor of Law and the Director of the Business Law Program at the University of Maryland Francis King Carey School of Law, Professor Harner teaches courses in Bankruptcy and Creditors Rights, Business Associations, Business Planning, Corporate Finance, and Legal Profession. Professor Harner is widely published and lectures frequently on various topics involving corporate governance, financially distressed entities, risk management, and related legal issues. She is a member of the Dodd-Frank Study Working Group for the Administrative Office of the United States Courts, and is an elected member of the American Law Institute and fellow of the American College of Bankruptcy. Professor Harner previously was in private practice in the business restructuring, insolvency, bankruptcy, and related transactional fields, most recently as a partner at the Chicago office of the international law firm Jones Day.